This is our dog Jake. We got him from the New Skete Monastery in Cambridge, NY when he was 8 weeks old and only 11 1/2 pds. He will be 9 months old on 7/29/11. He's 84 pds and growing! He loves being outdoors, if he could live outside all day he would. Loves playing ball outside. Still hasn't decided whether to jump in the swimming pool, to him it looks like one big water dish! Yet he loves being sprayed with the hose, he can't get enough of that which is odd. Loves to chase the bunnies in the yard and birds. Recently he discovered fire flies before they light up, I can't even tell they're around but he can sniff them out! He may look intimidating but he really is a sweet puppy, very affectionate and protective. We love him to death!! Hey, Toni, so nice to hear from you all the way up there in New York. I hope you and your big beautiful German Shepherd Puppy Jake are still doing so good. And I am so impressed that you got your handsome Jake from the monks at the Skete Monastery in Cambridge, NY. I am such a big fan of theirs. I have always wanted to visit their kennels. I have seen so many of their specials and have read several of their books but have never seen a sable German Shepherd at any of these. 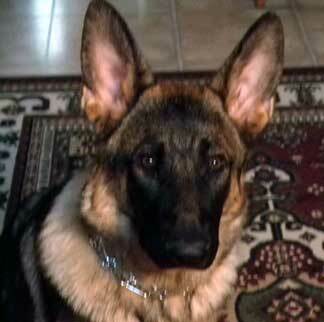 But your Sable German Shepherd Puppy Jake is indeed impressive. Do you still get to talk with them as needed? Either way, impressive and good for you both. 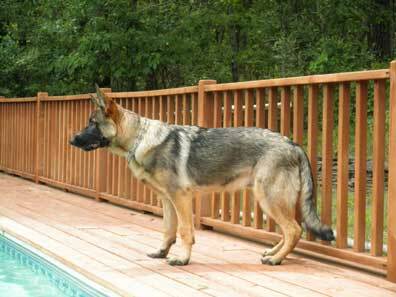 Jake is a growing into a nice specimen of a Sable German Shepherd. So readers, if you get the time, please leave Sable German Shepherd Puppy Jake some nice comments - we'd love to hear from you. We'd also love to see your GSD photos and videos - after all the German Shepherd is one of the most beautiful and incredible canines on the planet! I'm sure we can all agree on that. What a pretty boy! Best of luck to you both. Indeed, Jake is beautiful. I'm glad he's doing so well with you. I have a sable boy named Kodi that just turned 1 year. He is also a pleasure to own. He loves to play and is very comfortable at his obedience classes. We camp and he loves to ride on our golf cart. His best time is playing with our 6 year old female Cheyenne. They are our pride and joys and we love them to pieces!